Only 29 years after the end of the American Revolution, the United States and Great Britain were once again at war. In large part due to British impressment of American sailors and seizure of American ships, what would become known as the War of 1812 began June 18, 1812. The unit which would become the 9th New York State Militia served in Manhattan during this conflict. To protect New York City from British invasion, the predecessors of the 9th NYSM manned the guns of the North and West Batteries. Though these soldiers did not see action, the experienced gained during this time made this unit more well trained than many other state militia units. With the end of this war and the signing of the Treaty of Ghent on December 24, 1814, the duties of the 9th NYSM changed from defending forts to quelling different riots in New York City. Political corruption, racial tensions, and gang violence in New York City prior to the Civil War caused many conflicts. The predecessor unit of the 9th NYSM helped subdue a riot over abolition in January 1835 and that same year assisted in fighting the Great Fire of December 17th. 1857 saw a need for state militia to stop violence in the city because of two major riots. 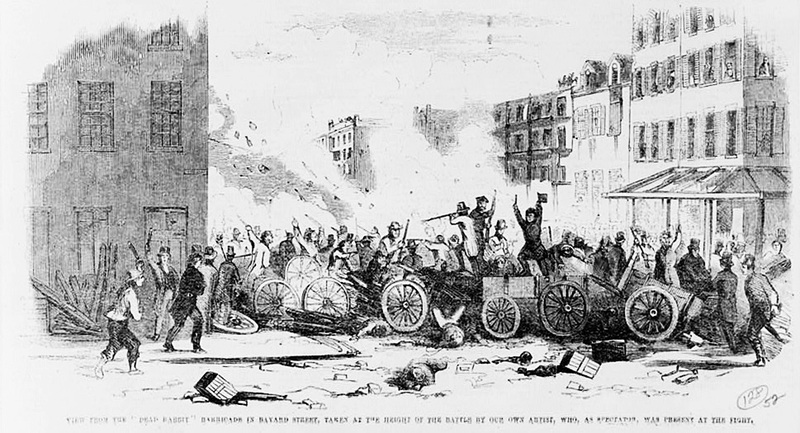 The first of these riots was the Police Riot which occurred on June 16-18, 1857. Tensions between the newly-disbanded New York Municipal Police and the new Metropolitan Police started this riot. After incredible corruption in the police force under Mayor Fernando Wood, the State of New York dissolved the Municipal Police and instituted the Metropolitan Police which a five man board appointed by the Governor of New York controlled. Some Municipal Police members supported the mayor and others joined the Metropolitan Police in support of the governor. Tensions began when Mayor Wood forcefully rejected a commissioner appointed by the governor from City Hall. A Metropolitan Policeman attempted to arrest the mayor but was thrown out of City Hall by members of the Municipal Police. More Metropolitans came to serve the arrest warrant but a larger group of Municipal Policemen drove them back. After yet another attempt to arrest Mayor Wood, Major General Charles Sandford of the New York State Militia surrounded City Hall with militiamen (members of what would become the 9th NYSM were involved) and forced Mayor Wood and his Municipals to surrender. A total of 53 people were injured during this conflict. The next month tensions between immigrant and native gangs in New York City came to a boil on July 4, 1857. The Dead Rabbit gang led a group of gangs from the famed “Five Points” to attack the native Bowery Boys. After fighting each other for a few hours, police arrived to intervene. The gangs, however, turned on the police and drove them away. The police needed the assistance of the New York State Militia. The predecessor to the 9th NYSM arrived with fixed bayonets to drive the gangs and other rioters back. Late in the day of July 5th, New York Police and the Militia quelled one of the largest riots in New York City history. The casualties from this riot were 8 people dead and almost 100 wounded. Fortunately, no members from the militia were injured. Experience in subduing rioting gangs would be quite different than the experience awaiting the men of the 9th NYSM. As the country moved toward disunion in 1860, the 9th NYSM continued to have routine drill in preparation for active service. At the outbreak of the American Civil War, President Lincoln called for 75,000 volunteers to put down the southern rebellion. One of the first units to answer this call in May 1861 was the 9thNew York State Militia. Equipped by the armory on West Fourteenth Street these men from Greenwich Village marched to war with very little experience in conventional battles. And you’re right a lot of themes overlap in our blog posts this week! In the course of my research I read that the reason the militia had to step in during the Dead Rabbits Riot was because of the power struggles between the Metropolitan and Municipal police departments rendered them ineffective in quelling the violence. One thing I did not find much information on but that was curious to me was the fact that in a lot of these riots many citizens died, often at the hands of the militia. This would be unthinkable in New York City today so I wondered if incidents like this made the militia unpopular with New Yorkers or if these deaths were seen as an unfortunate side effect of urban violence? Did you come across anything relating to this in your research? Really interesting post! Earlier this week, I read an article for another class about the effects of the War of 1812 on Nantucket. Mostly a Quaker population, the Nantucketers were not very interested in the War. They became especially upset with the war when it kept them from whaling and even from importing good from mainland areas. Eventually, Nantucket politicians circumvented the US government and dealt directly with British commanders – who actually hoped to move the Nantucketers to Nova Scotia to make them part of the British empire again! – and declared themselves neutral in the war. Only tangentially related, but the Nantucket article and your post made me see how one conflict (here, the War of 1812) could affect two places in such different ways.